Hello! Welcome to day 3 of Taylored Expressions December Sneak Peeks! We are releasing several new stamps & dies! All products will be released tomorrow @ 7 AM PST. Here's a look at each tag. 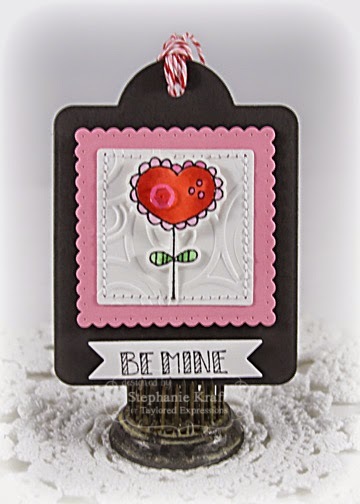 Each base is cut out of Poppy Seed cardstock and layers are with Strawberry Milkshake and Sugar Cube (embossed with the Twirls & Swirls Embossing Folder). Each image was stamped, colored with Copic markers and die cut. The die cut "LOVE" below is included with the Tag-a-long Valentine dies. "U" is wood veneer. And now the puppy. 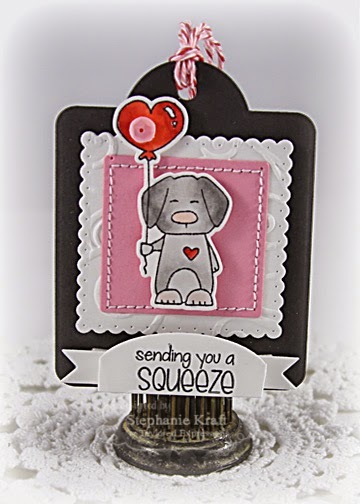 The sentiment was stamped and die cut with Build a Tag 1. 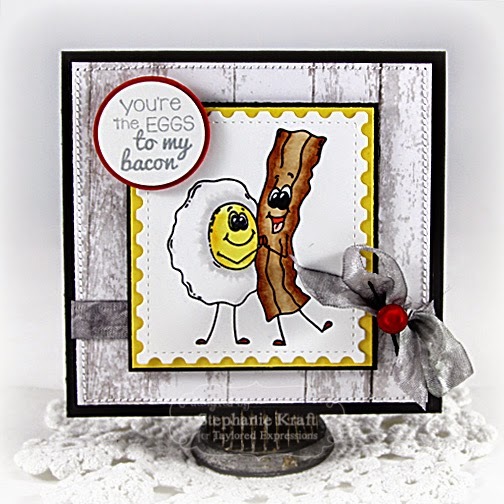 Next is a card using Perfect Pairs Eggs & Bacon, a new series of stamps! 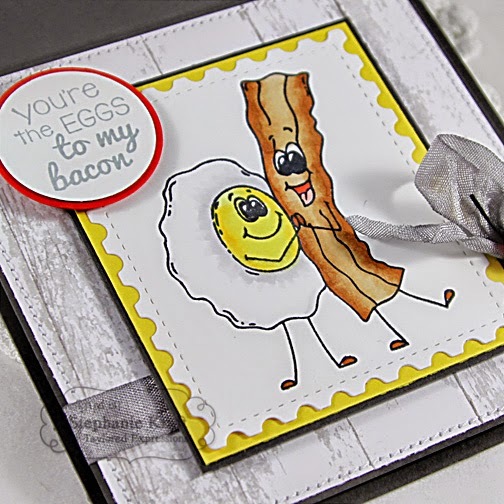 I stamped and colored the egg and bacon and once again used Postage Stamp Stacklets to die cut the pair. 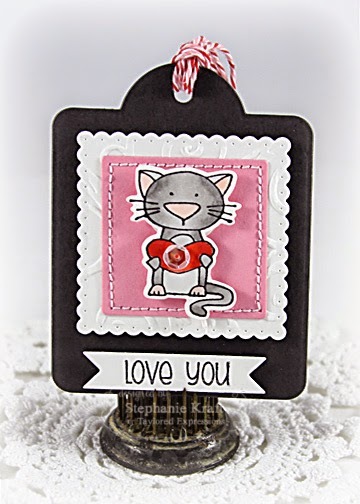 Accessories: Taylored Dies: Tag-a-long Valentine, Build a Tag 2, Build a Tag 1, Twirls & Swirls Embossing Folder, Formula for Love Sequins (TE); Markers (Copic), Divine Twine, Wood veneer "U" (Studio Calico), Foam tape, Thread, Sewing machine. Accessories: Taylored Dies: Postage Stamp Stacklets (TE), Circle punches (EK Success), Markers (Copic), Seam binding, Button, Black twine (May Arts), Foam tape, Thread, Sewing machine. Super cute. Love those tags. Great details. Love your card and tags so cute. I was not able to comment about your gorgeous cards yesterday and wanted to tell how pretty they were. This comment box wouldnt let me type anything, not sure if it was my computer or something else, anyway they were really very pretty.